The life cycle model is a generic model. It can be applied to all test levels and test types and used in parallel with the life cycle models for system development. In the TMap life cycle model, the test activities are divided across seven phases: Planning, Control, Setting up and maintaining infrastructure, Preparation, Specification, Execution and Completion. Each phase is split up into a number of activities. In the Planning phase, the test manager formulates a coherent approach that is supported by the client to adequately execute the test assignment. This is laid down in the test plan. In the Control phase the activities in the test plan are executed, monitored, and adjusted if necessary. 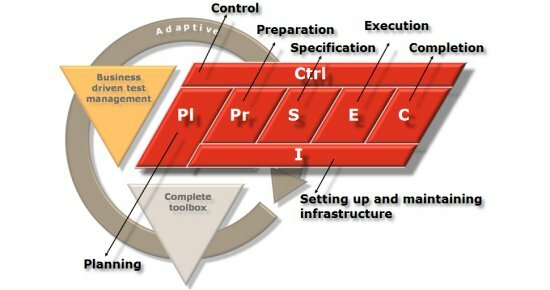 The Setting up and maintaining infrastructure phase aims to provide the required test infrastructure that is used in the various TMap phases and activities. The Preparation phase aims to have access to a test basis, agreed with the client of the test, of adequate quality to design the test cases. The tests are specified in the Specification phase and executed in the Execution phase. This provides insight into the quality of the test object. The test assignment is concluded in the Completion phase. This phase offers the opportunity to learn lessons from experiences gained in the project. Furthermore activities are executed to guarantee reuse of products.